Perfectly staged in the island's city center, this spectacular downtown Key West rental received a major renovation to become the fabulous Penthouse on Duval. This unique private Caribbean style penthouse is the perfect prescription for some lofty relaxation. 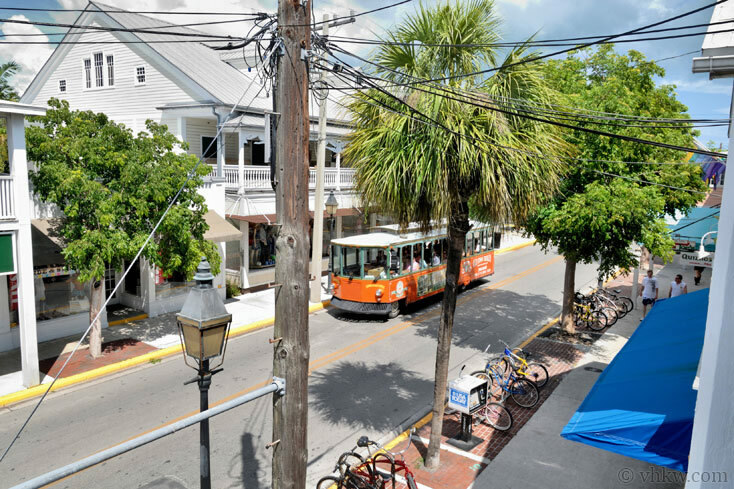 Perched just above the fun and frolic of the 700 block of Duval Street below, you're sure to capture the 'urban life' that stirs this tiny tropical island. 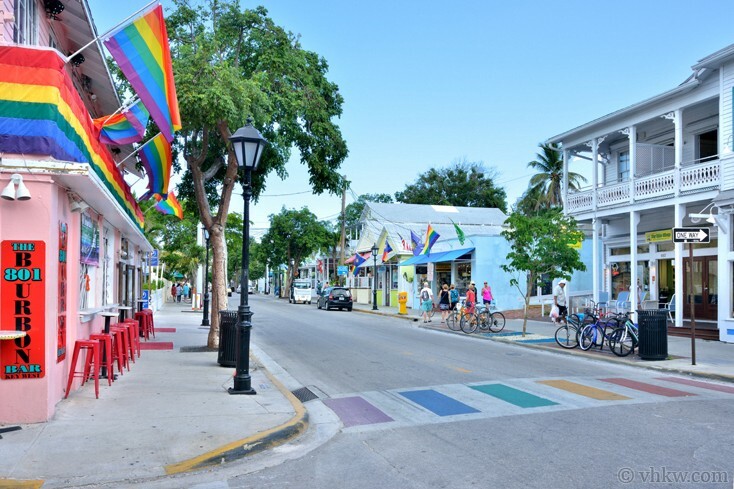 The Way It Was: If you've ever strolled up bustling Duval Street in downtown Key West, then you've also been touched by the timeless charm of historic Key West-Victorian structures that house the local establishments. Peaked tin roofs, horizontal wood siding and enchanting gingerbread trim were classic trade marks when these early 1900's downtown buildings were first built. And one popular property design embodied a mercantile space below with a residential home 'up top', complete with wide covered sitting porches designed for gazing below at the 'comings and goings' of island life. Nowadays, while most of the 2nd floor spaces on Duval Street have turned completely mercantile, an exceptional few have kept their 'up top' residential spaces. If you set your gaze to the upstairs sitting porches, you can't help but imagine what it must be like to live up there with a 'bird's eye view' of the street. And in the case of this "Penthouse On Duval" its pure dream-worthy pleasure inside... and now you have the opportunity to stay here and experience it for yourself! The Way It Is: Two things became clear to the owner-designer when she first caught glimpse of this 2nd floor centurion space. One was that this remnant of a 19th century abode was right in the center of Duval Street and would make an absolute ideal Key West vacation rental; while the other was that it had been through too many years of wear and neglect and would require a complete and total make-over. But the Alabama based artist-owner (who has re-designed several properties she owns with her husband) is no stranger to creative challenges. They both love the Caribbean ambience of Key West and it's historic architecture, and after several years of diligent planning and undying tenacity through a myriad of 'renovation wars' they've completed the daunting challenge of turning an 'old sows ear into a stylish silk purse'! When you walk through the newly designed interior space the rooms artistically unfold before you with a colorful spirit that is at once playful and downright deluxe. 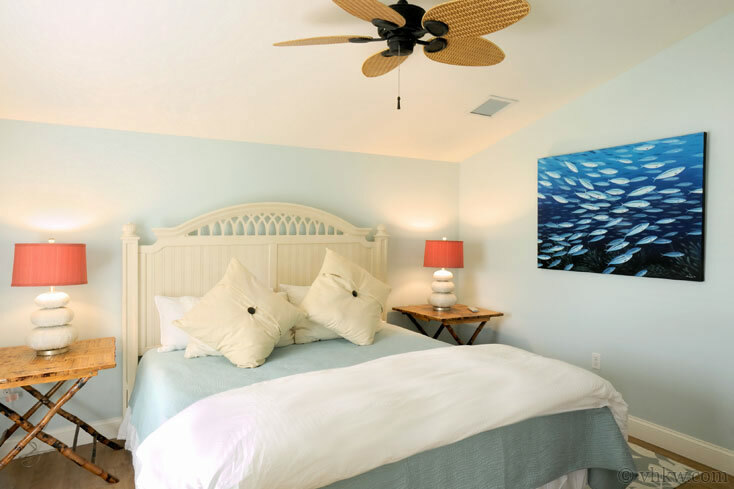 Each and every room is unique in design and each is set with beautiful furnishings, custom wall colorings and floors, and unique and colorful island art work. 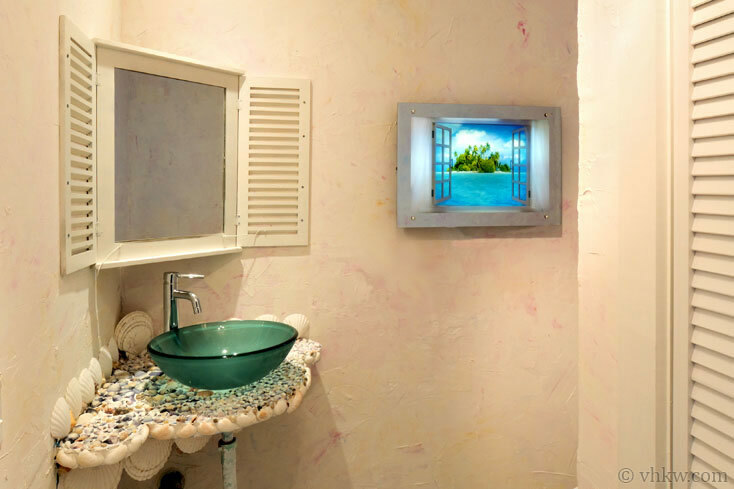 Even the powder rooms in this property stand as gorgeous little 'art alcoves' that reflect the artist-owners commitment to bringing art into everyday life activities. 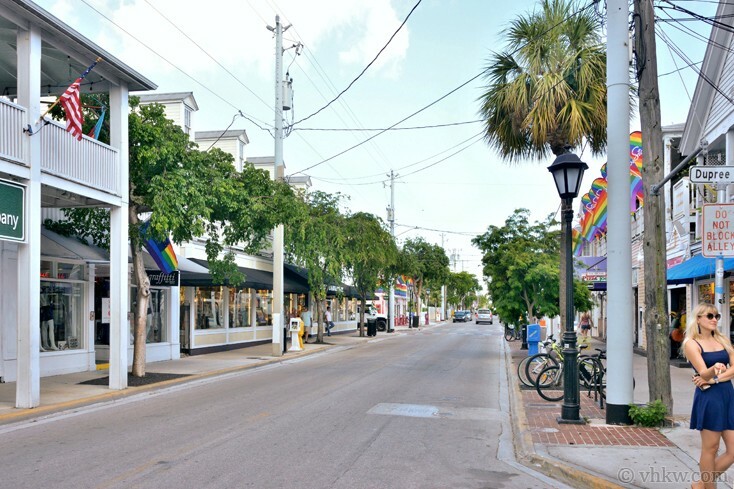 Layout: Since the exterior of this Old Town building is under the protective eye of the Key West Historic Architectural Review Committee (HARC), the Duval Street facade must always retain its historic persona to help preserve the original character of the island. In order to re-design the upstairs to become luxurious and spacious, permission was obtained to increase the height at the back of the building to create two floors of living inside plus a private back deck outside, with parking beneath. The main entrance to the penthouse is from the back of the building. A traditional wooden staircase takes you to the second floor where you will find your colorful hidden haven. 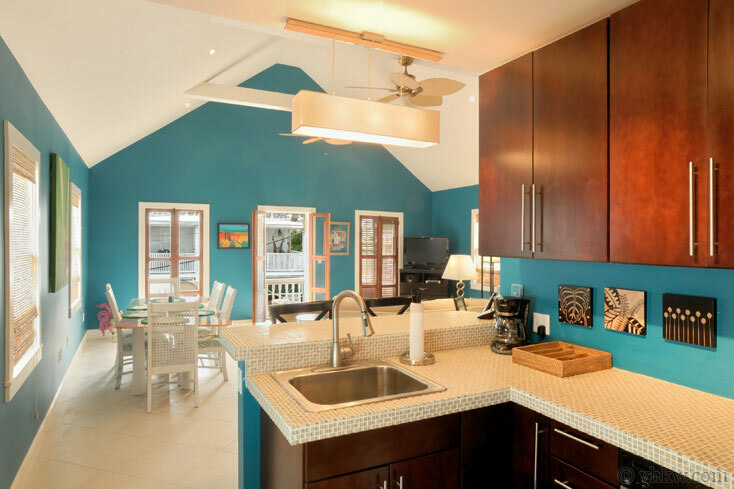 With a commitment to historic preservation and modern day comfort, the Key West rental was thoughtfully reconfigured so that it can be rented as one larger 4 bedroom unit or as two separate 2 bedroom units. When rented separately, an inconspicuous 'lock out' door in the central hall works to securely divide the property. 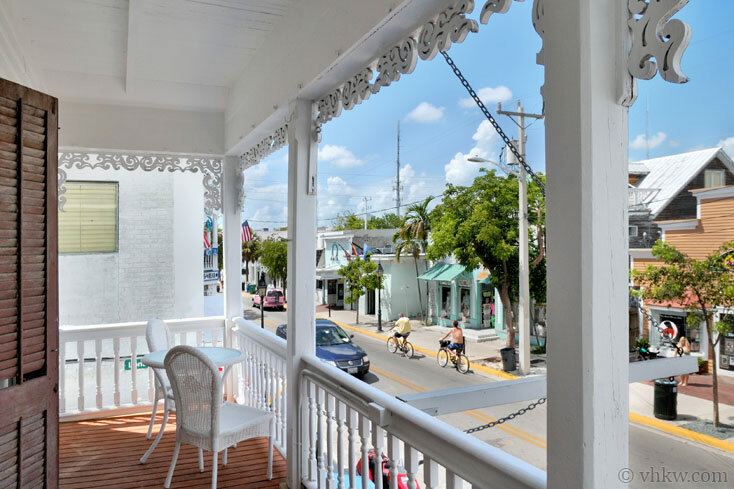 City Island View - Situated on the Duval Street side of the building, this festive Key West rental unit features the original front porch that spans the width of the building with a commanding 'front and center' view of the 700 block of Duval Street below. The porch connects to the stunning great room which has soaring open beam ceilings with designer lighting and tan wicker paddle fans. The owner-artist hand selected a wonderful selection of eclectic furnishings to pull the entire presentation together. Custom colors and unique artwork take their cue from the Caribbean Sea with vivid turquoise walls and oversized diagonally placed sand colored floor tile. I love how the owner has paired the oversized curvaceous cream colored sectional with the round dark wood accent tables, and how a playfully painted artisan dining table is set off with traditional white wicker dining chairs. A collection of unique lamps and carefully chosen artwork complete the perfect great room picture. The master bedroom, with king size bed, is situated just off the back of the living room. Dark mahogany furniture set against cream colored walls and a sky blue ceiling give a West Indies feel to the space. 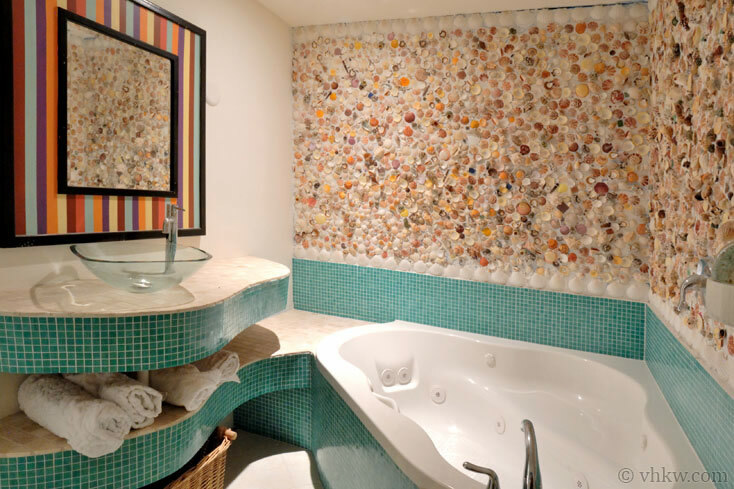 The entire master bath is an art piece in and of itself with rounded counters tiled in mini aqua tiles and a brilliant smattering of sea shells that covers one entire wall and frames the Jacuzzi bath tub. The 'sea shell wall' has become a signature of this owner-artist in her renovation and design work. The precious powder room on the first floor is like a little monument to the islands with a shutter framed mirror, a hand made pedestal counted 'tiled' in sea shells and glass. 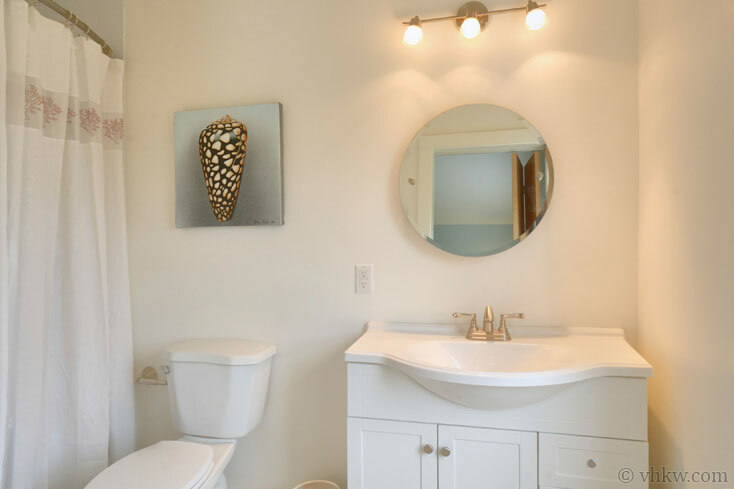 Even the wash basin in reminiscent of green colored sea glass and an electric photograph of a deserted island takes the decor over the top. 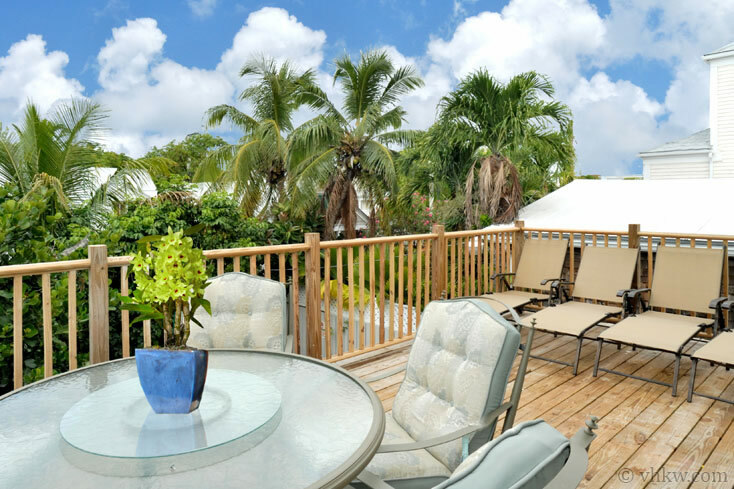 Starlight Siesta - Secretly situated at the end of a little lane that runs along the right side of the building, this Key West rental features a brand new back lounging deck that nearly spans the width of the building and provides a hidden space for stargazing in the city. The deck connects to a spacious great room which is elegantly furnished with West Indies style linen and woven grass furnishings. As with the front unit, a unique collection of lamps, accessories, and carefully chosen artwork complete this 'picture perfect' great room. In a beautiful contrast to the front unit, soft and relaxing colors were chosen for the back. I love the use of sky blue paint on the ceiling of the great room which helps to bring the outdoors inside. This practice is common for outside porches in Key West and its use inside is inventive and uplifting. The artistic powder room puts the great room over-the-top with rich gold toned walls, designer podium style vanity topped with a clear glass bowl sink, and unique lighting. 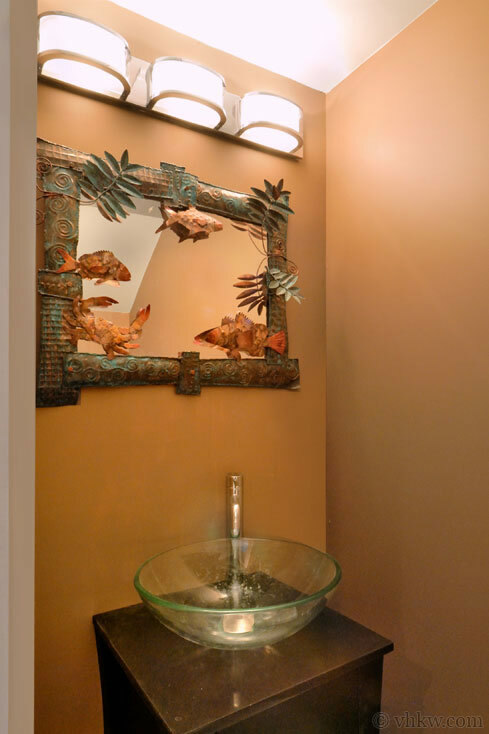 A metal sculpture of sea creatures frames the vanity mirror creating yet another art space to enjoy. The elegant kitchen connects flawlessly to the great room via an artistic island dining counter. Tiny sand-stone tiles set in the counter top are artistically placed on the diagonal and offer a refreshing change from overused granite that we see so much of these days. Shiny stainless steel appliances are set off with custom mahogany cabinets, designer lighting, and a grand size gold-framed decorator mirror that is set above the stove. Both bedrooms with en suite bathrooms are just up the stairs on the 2nd level. 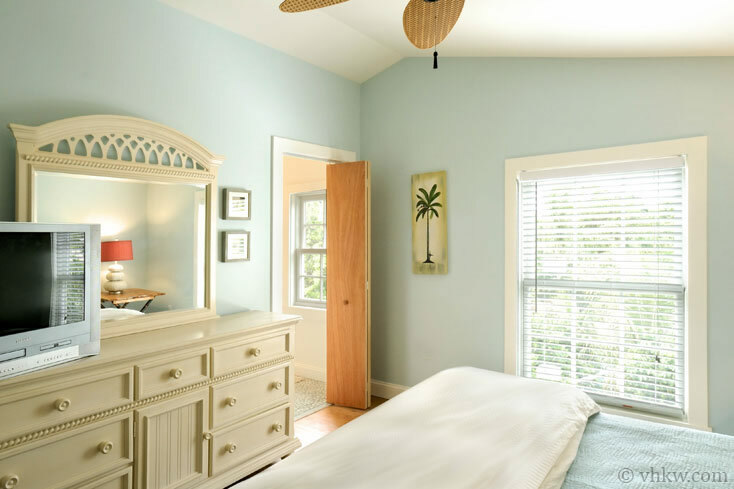 The master bedroom, with king size bed, shows an eclectic collection of white wicker and golden bamboo furnishings set against sky blue walls and light hard wood floors. Custom lamps and unique ocean theme art and rugs accessorize the room. 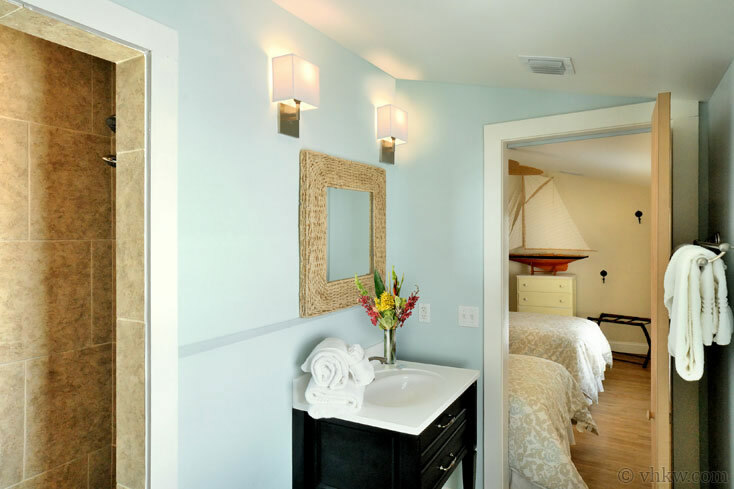 The bright white master bath is kept simple and elegant. The 2nd bedroom and bathroom are also located upstairs just off the hall. Island decor with a nautical theme was chosen for this bedroom that has two twin beds that can be pushed together to make a king size bed. 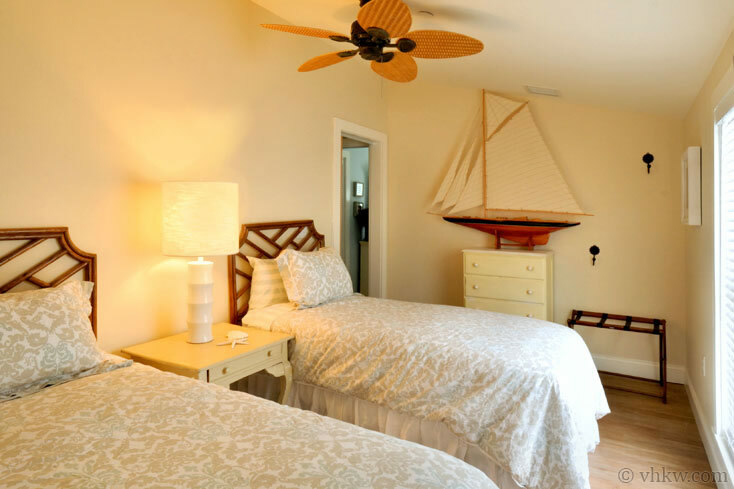 White cottage furniture mixed with rattan, light wood floors, and a wicker paddle fan create and inviting room which is artfully accessorized with a large scale model of a wooden sail boat. NOTES: In the redesign of this property, all four bedrooms are situated back away from the street to obtain maximum quiet possible. Despite the prime Duval Street location we have noted how quiet the space is whenever we have been inside. You would never guess this gorgeous private Key West rental is here, given its central location in the 700 block of Duval Street. 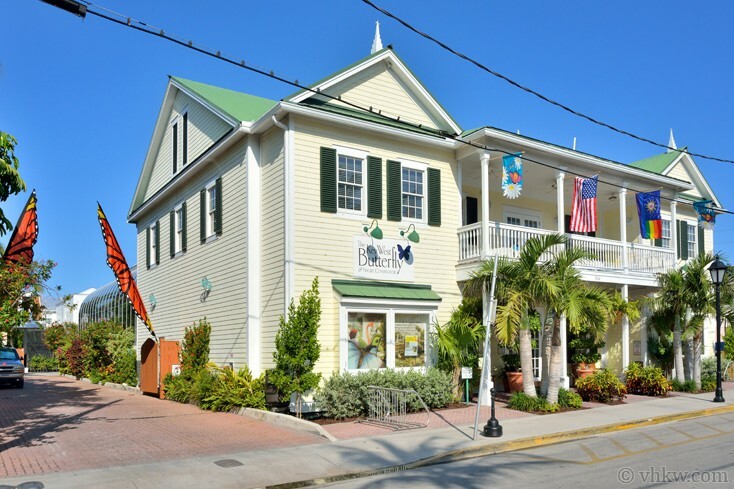 We congratulate the owners on such a remarkable transformation of a historic Key West building to become a spectacular Key West rental. Job well done! Amenities: Wide porch overlooking the 700 block of Duval Street. Large back deck. Brand new artistic renovation. 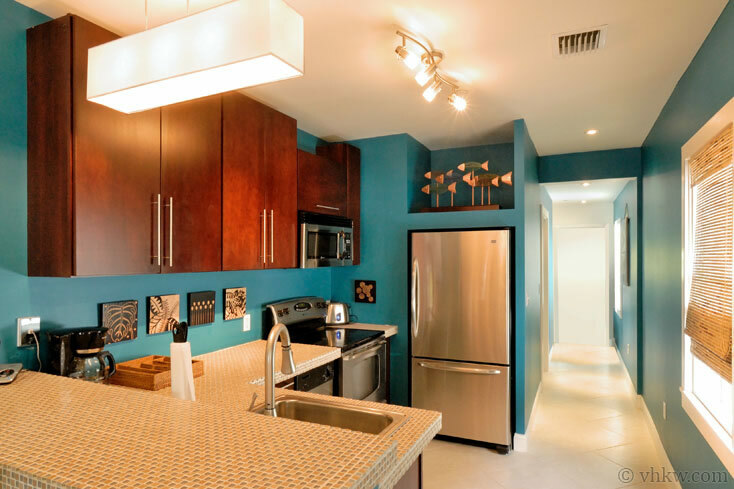 Two fully equipped kitchens, a/c, two washer/dryer units, telephone, and color cable TVs. Linens and towels are provided. Catering can be arranged. Maid service can be scheduled. Parking: Private off - street covered parking for 1 compact car maximum located at the end of the lane underneath the deck. If you arrive by car, please plan to park it in your private parking space and forget about it. Enjoy walking or biking around the island. Restrictions: Smoke free property. Smoking permitted outside only. No pets. We do not accept guests less than 25 years of age unless accompanied by a family group or guardian. 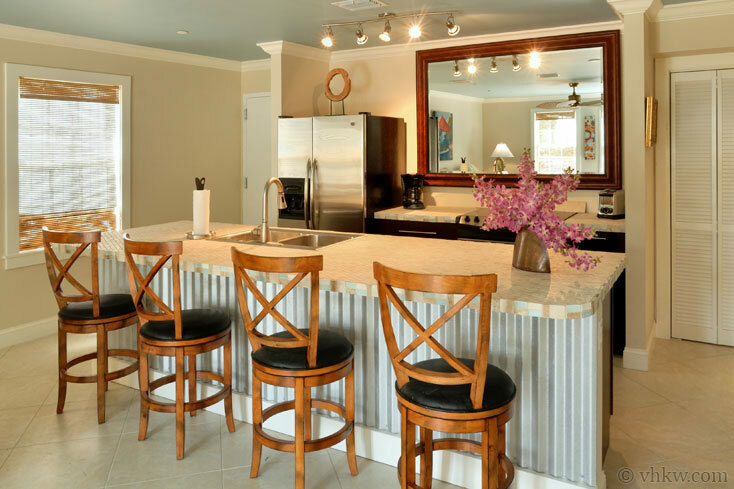 This home is offered as an exclusive vacation rental in the most requested location in Key West. Apr 20, 2019 - May 26, 2019 $4200 $775 4 night min. or 3 night min. 60 days prior to arrival. May 27, 2019 - Jun 14, 2019 $3800 $675 4 night min. or 3 night min. 60 days prior to arrival. Aug 9, 2019 - Oct 19, 2019 $3800 $675 4 night min. or 3 night min. 60 days prior to arrival. Oct 27, 2019 - Nov 3, 2019 $3800 $675 4 night min. or 3 night min. 60 days prior to arrival. Nov 11, 2019 - Nov 22, 2019 $3800 $675 4 night min. or 3 night min. 60 days prior to arrival. Nov 30, 2019 - Dec 20, 2019 $3100 $675 4 night min. or 3 night min. 60 days prior to arrival. Jan 4, 2020 - Jan 10, 2020 $4000 $900 4 night min. or 3 night min. 60 days prior to arrival. Jan 11, 2020 - Jan 17, 2020 $4200 $900 4 night min. or 3 night min. 60 days prior to arrival. Jan 18, 2020 - Jan 24, 2020 $4200 $900 4 night min. or 3 night min. 60 days prior to arrival. Apr 18, 2020 - May 24, 2020 $4300 $775 4 night min. or 3 night min. 60 days prior to arrival. May 25, 2020 - Jun 12, 2020 $3900 $675 4 night min. or 3 night min. 60 days prior to arrival. Aug 8, 2020 - Oct 22, 2020 $3900 $675 4 night min. or 3 night min. 60 days prior to arrival. Nov 16, 2020 - Nov 19, 2020 $3900 $675 4 night min. or 3 night min. 60 days prior to arrival. Nov 29, 2020 - Dec 18, 2020 $3200 $675 4 night min. or 3 night min. 60 days prior to arrival. I just returned from two fabulous weeks (12/1-12/15) in Key West celebrating my birthday with friends. We stayed at the Penthouse House on Duval and had both units. What can I say, the property was everything we could have asked for and more....spacious, great location, comfortable beds, plenty of bathrooms. Not to mention a front row seat to all the happenings on Duval, including the Christmas parade. I consider this house a gem. Items to note: If you are a light sleeper, late night music from surrounding bars can be heard in the back bedrooms - it was good music, so it didn't bother me. If stairs are any issue, this might not be the property for you. There is a moderately steep wooden staircase leading up to the property, and all but one bedroom must be accessed via stairs. The stairs leading up to the house can be pretty dark at night. There may have been a switch to an outside light, but couldn't find it. All that being said, I still give it 5 stars. I also have to mention that Paige at KHKW was awesome to work with during the process. She was always pleasant and helpful. I would not hesitate to rent this property or work with the folks at KHKW again. We had a wonderful time! The penthouse was lovely, although, Duval Street is a bit loud sometimes. Your staff made our stay easy. Thank you so much. We will call you again and recommend you to friends. This was our second year to rent this property and Finlay and the entire office team went above and beyond to make our trip fantastic!! Check in and out is super easy and we have already booked again for oct 2019!! Everything in description of property was accurate! Great experience. Just a FYI, as we pulled into parking space when we arrived and got out of my car, a contractor for the property behind the Penthouse on Duval approached us and said, “I can’t believe you assholes pay so much for this property” (in reference to Penthouse on Duval). Extremely pleased with the house! The penthouse on Duval was perfect for our event and we loved the location. It’s a unique house, but we had eight people fit with plenty of room. I would definitely rent again! We enjoyed our stay. There was plenty of space for our party of 11. Parking was a little tight, but we made it work. House was clean and well maintained. 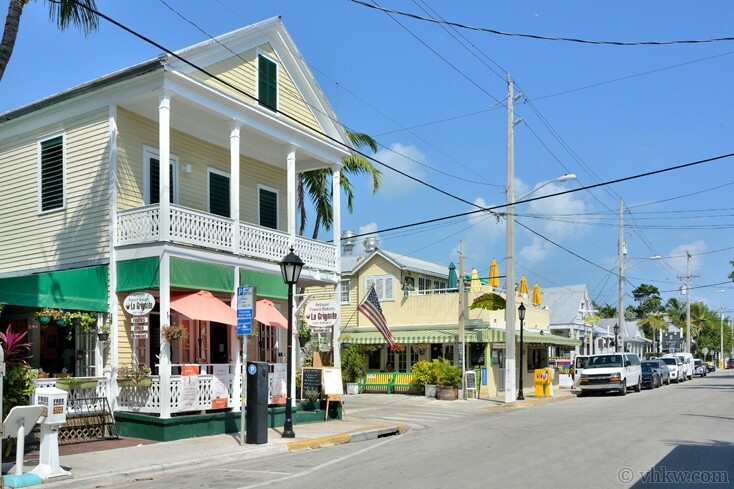 I will certainly rent from Vacation Homes of Key West in the future. They were professional and accommodating to my every request. Excellent place. Will book every year. Booking a place through VHKW was easy and they provide great options. They were able to answer any questions beforehand and everything was as described when we got to the rental. Would definitely reccommend them. We loved the Penthouse on Duval! Perfect location and the house itself was great - we had everything we needed and more! Beautiful home! Easy to reserve, pay and get all the info you need prior to check in and during our stay. Excellent location. The house was beautiful, exactly as pictured. All kitchen utensils you could ever need. I had requested the bedrooms to be made up in king beds, but when I got there some of them weren’t. A quick phone call and it was fixed when we got back from dinner. Great communication. I would definitely stay here or other homes with this company again. Everyone’s favorite feature of this home on Duval St was the dollar bill attatched to some fishing line on the front porch. It made for a lot of entertainment! Perfect location on Duval St plus you get to sit above the street and people watch 24/7. This place is amazing. Great location, lots of room and it's beautiful. We had four couples staying there and there was more than enough space for all of us. We were already talking about booking it again for next year before we even left. The staff was very helpful as well. Also,The off street parking spot was key. I would definitely recommend this place to everyone I know that's planning a trip down. I've stayed in more places in key west than I can count and this one spoiled me. 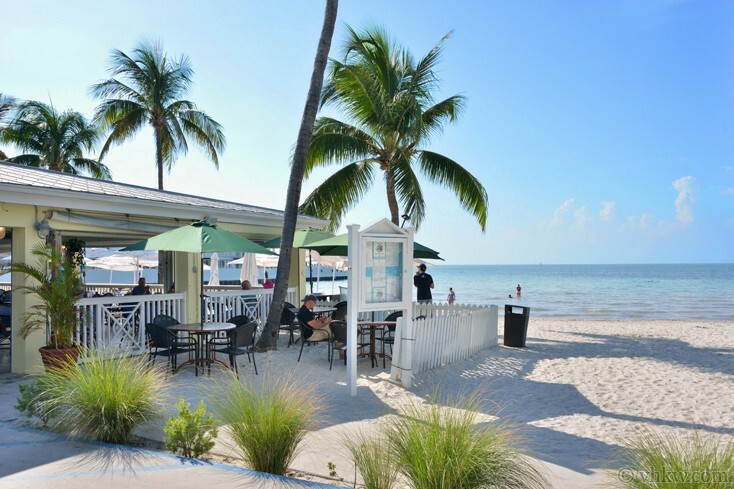 We have always used vacation homes of Key West when visiting our happy place . Unparalleled selection and service. We have never been disappointed! Penthouse was great. We had a total of 8 adults with us and we all enjoyed the penthouse and the location. If in the area again we will stay there again. Huge property and the perfect location for our group in town for my bachelor party. Close enough to walk anywhere in old town but far enough from the rowdy end of Duval to get some sleep when you need it! The unit is nicely updated and very spacious. The best part for us was the balcony overlooking Duval, which made for some great people watching. Booking process was very easy as well. Definitely booking here again on our next group trip!